As we close out 2013 and welcome the new year, many of us are now beginning the task of cleaning and putting away all of our Christmas decorations. If you don’t already have a system in place to organize and track your traditions, events, recipes, decorations, and gifts, I suggest you do! It will make your life so much easier next year and you will be glad you did! This simple binder holds all the information that my family needs for the holidays. This means not only do I know where we put things away the year before, but that my whole family can look in the binder and see how we decorated last year and what boxes need to be brought out of storage. It also means it is easier for me to get help, since my husband doesn’t have to try to read my mind about exactly what I mean when I ask him to get the Halloween box out or wash the casserole dish for stuffing. 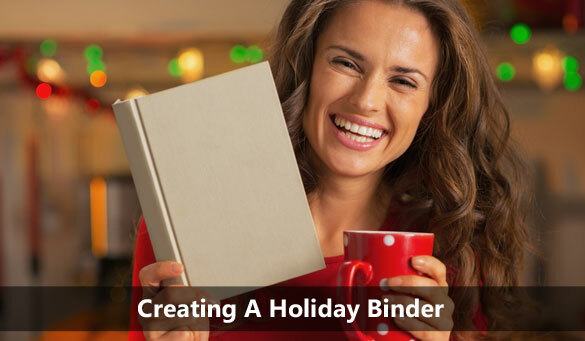 Here are a few tips for creating a Holiday binder of your own. It doesn’t have to be pretty, or have fancy matching color coding. It just needs to be functional and organized in a way that makes sense to you. Supplies: A two inch three ring binder, clear plastic page protectors, and some sort of section dividers. Holiday Calendar: What holidays do you celebrate? For smaller holidays/important days you might just have one page with date, holiday and brief description of how you celebrate. Traditions: What are your traditions? For the smaller ones, a little note on the Holiday Calendar might be enough, but for larger holidays, break them down into sections with a page for each tradition. Detail the what, who, where, and how of each tradition plus any important notes like if you need to decorate, prep or invite people ahead of time. Events: Holiday fairs, Pumpkin patch trips, Christmas tree lightings, or light parades. Being able to fill in these events ahead of time allows you to see potential conflicts with schedule and not over plan a weekend. Decorations: We keep pictures of every room that gets decorated for the holidays with notes on where things go, as well as a list of decorations and where they are stored. We keep our decorations in labeled plastic containers. Recipes: Recipes for important holiday foods that are traditionally made each year. Nothing is worse than trying to find that amazing cookie recipe you made last year, or your copy of an old family recipe and not being able to figure out where you stashed them. Birthdays/Addresses: I keep a list of birthdays and cards addressed to everyone bundled together by month and stamped so that you toss the whole pile in the mail at the start of the month and you don’t have to worry about forgetting to send anyone a card. Gift list: You can keep a list of who you need to buy or make presents for, both for holidays, birthdays, and special events. Not only does a binder help you stay organized every year, and reduce stress around celebrations, it also becomes a keepsake, and record of your family’s time together.